It's been exciting to see new K-beauty products trickle onto Sephora's shelves, and we certainly have our pick of online marketplaces devoted to landing the best Korean beauty products here in the United States. But what about brick-and-mortar stores? Maybe some of the thrill of trying out brilliant (and often whacky) Korean trends, brands, and products is that we often just have to order the cosmetics sight unseen. But then again, we've been really craving a place to shop it all in person. Which is why we're so pumped to hear that our very own Korean beauty correspondent, Alicia Yoon, is launching her K-beauty site Peach & Lily as a brick and mortar—within Macy's, believe it or not. 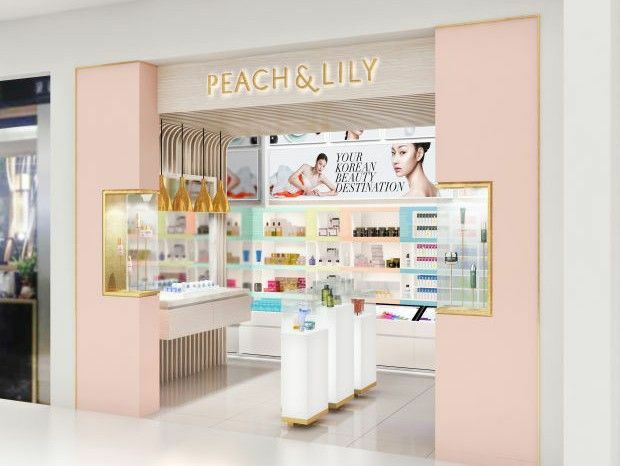 Yoon announced earlier this week that the first Peach & Lily store-within-a-store will be opening its doors in New York at the Macy's in Flushing, Queens next week, with other destinations soon to be explored. Keep scrolling for our exclusive interview with Yoon to learn exactly how this store came to life! Tell us a little about how you first got in contact with Macy's. Yoon: This past summer, someone heard me speak at an event and came up to me and asked if I had ever been in touch with Macy's. She thought that Macy's "would find Peach & Lily fascinating," and said that she'd "put us in touch immediately." I wasn't sure what to expect, but before I knew it, I was meeting with an executive there. And by the end of that first meeting, somehow we were both excitedly discussing how Peach & Lily should open a store at Macy's. Was opening a brick and mortar something you always wanted for Peach & Lily? Yoon: I had always dreamed of opening up a Peach & Lily brick and mortar store since first launching the company. Serendipitously, I had always wanted this to be in Macy's as the dream is to make Korean beauty as widely known as possible, and Macy's is the biggest department store in the U.S. with 800+ locations. After years of keeping this dream in the back of my mind, this conversation was completely surreal. I remember at one point in that first meeting, I was so elated that I was practically dancing around the office and animatedly outlining how everything would be organized in the store. Yoon: It took me a few days to really process the opportunity that we were given, and then I felt immense gratitude and a quieter excitement as I reflected on the past years and the future to come. Then, it dawned on me that I had zero knowledge about how to build a brick and mortar store. So all that exuberance and energy had to be channeled into focus and figuring out how to make this happen—and to do it all before Thanksgiving so that we could be open for full-blown holiday season. It's been a whirlwind summer and fall, but now I can say I know a lot more about how a construction site works and that I have the best team possible! What can customers expect from the new store? Yoon: To begin with, products aren't organized by brand but by the steps of the Korean beauty ritual and by skin needs. And because there's a big focus on education and product-client matching, people can use an imaging device in the store to analyze their skin type and skin needs. There's also a lot of content on the LED screens and on the shelves that help explain the brands, the steps of the routine, and how skin works. The store team isn't there just to stock items and ring things up, but will be "beauty coaches" who can help walk someone through the skin analyzer results, the routine, the products, and even follow up with clients long after they've left the store to see how their routine is going. There's also a section called "Alicia's Picks" because we get a lot of questions about the latest that I'm seeing real-time when I go beauty-hunt in Korea, so that section highlights a slice of Korea through my lens. We also have some exciting new brand launches happening when the store opens! Will the store be offering different products from PeachandLily.com? Yoon: Within the first month or so of opening, we'll have most of what's in the offline store on www.peachandlily.com, but there might be a few products that will be available only through the store, so if you're in the NYC area, I would love for you to come visit our brand new shiny store in the Macy's at Flushing! What is your favorite part about the new store? What are you most proud of? Yoon: This is a tough question! Each part of the store, including the experience we're providing through the store team, is such a dream come true and a result of a lot of ideation and thoughtful iteration. If I had to pick though, I would say the back wall where the majority of the products are organized by the Korean beauty routine and by skin need is my favorite element of the store. How do you think the new store will take Korean beauty to the next level in the U.S.? Yoon: To me, Korean beauty is about knowledge and personalization. Curating great products for a store isn't enough. Ensuring that people can find the right products for their skin type and skin needs is arguably more important. After all, if there's a product-user mismatch, the product can even harm the skin. The in-person interaction and our store experience allow us to completely amp up the education, personalization, beauty-adventuring, and product-matching, which is what I believe Korean beauty is about. And of course, because Macy's has such a huge presence in the U.S., there's enormous potential for us to explore opportunities for expansion, including into the flagship store in Manhattan in New York City, and to be able to reach so many more people who prefer to shop beauty in an offline store where you can touch, smell, and test products. We have to ask—what's the one product everyone should test out if they have a chance to visit? Yoon: The Dr. Dream Dream Age Radiance Powder Essence ($110)! This "powder" turns into a scentless, colorless liquid when poured out of the bottle and can be mixed in with any beauty product whether that's a foundation or a serum or a cream. Think of this as the skincare version of boosters that you add into juices. The powder is really tiny capsules that keep ingredients like vitamin C and rose stem cell extract fresh so that its more efficacious. It's pretty neat to play with this powder-to-liquid texture, and even more interesting to see how it invisibly mixes in with any other product. You won't be able to tell in the store just from testing it, but if you love it and take it home, this is going to turn a lot of ordinary products into extraordinary ones. Are you excited at the prospect of a Korean beauty brick-and-mortar destination? Do you think there should be more? Sound off below!